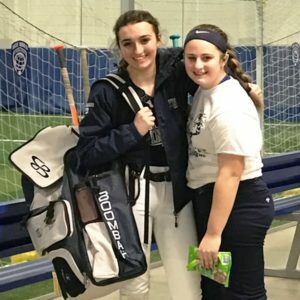 Welcome to Connecticut Shoreline Sting Girls Softball – Connecticut Shoreline Sting is a summer travel softball organization serving elite girls fastpitch team consisting of players dedicating to excellence in sports and in life. 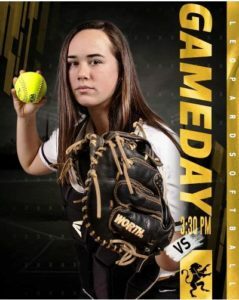 STING 18U AND WENTWORTH COLLEGE STANDOUT CATCHER AND OUTFIELDER, BRI BEVERLY WAS FEATURED ON THE COVER OF WENTWORTH’S NCAA “GAMEDAY” PROGRAM VS. GORDON COLLEGE. BRI IS A FRESHMAN STARTER AT WENTWORTH. SHORELINE STING IS PLEASED TO ANNOUNCE THAT JAELYNN POTTER HAS BEEN HONORED WITH THE MARTIN LUTHER KING, JR. ESSAY AWARD IN STATE-WIDE COMPETITION. JAELYNN RECEIVED THE AWARD IN A RECENT CEREMONY. 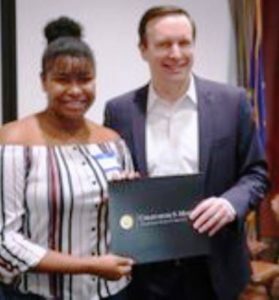 IT WAS PRESENTED BY CONNECTICUT’S US SENATOR CHRIS MURPHY. THE AWARD IS IN RECOGNITION OF JAELYNN’S MLK ESSAY, WHICH WAS SELECTED THE WINNER OUT OF OVER 1,000 ESSAY’S SUBMITTED IN THE COMPETITION. JAELYNN IS A STING 18U STANDOUT INFIELDER/CATCHER. SHE IS A JUNIOR AT NEW LONDON SCIENCE AND TECHNOLOGY MAGNET HIGH SCHOOL, WHERE SHE EXCELS ACADEMICALLY AND ATHLETICALLY, PLAYING SOFTBALL AND SOCCER. SHE LIVES IN NEW LONDON WITH PROUD PARENTS JOHN AND LISA. SHORELINE STING IS VERY PROUD OF JAELYNN AND WISHES HER WELL IN ALL OF HER ACADEMIC AND ATHLETIC PURSUITS. SHORELINE STING IS PROUD TO ANNOUNCE THE APPOINTMENT OF SHAE CROSBY AS HEAD COACH OF ITS 14U WHITE TEAM. SHAE IS A RECENT GRADUATE OF KEENE STATE UNIVERSITY IN KEENE, NH, WHERE SHE WAS A FOUR-YEAR STANDOUT PLAYER. SHAE WAS PRIMARILY A LEFT SIDE INFIELDER FOR THE OWLS, STARTING AT BOTH SHORTSTOP AND THIRD BASE. HER CAREER WAS HIGHLIGHTED BY HER ALL-CONFERENCE (LITTLE EAST) SELECTION IN 2017. SHE ALSO WAS SELECTED AS A PARTICIPANT IN THE NCAA LEADERSHIP CONFERENCE. IN HIGH SCHOOL, SHAE WAS GRADUATED FROM EAST LYME HIGH SCHOOL IN NIANTIC, CT, WHERE SHE WAS ALSO A STARTING PLAYER IN THE INFIELD. ALWAYS AN AGGRESSIVE LEADER ON THE FIELD AND IN THE DUGOUT, WE ARE CONFIDENT THAT SHAE WILL BE AN EXCELLENT COACH AND ROLE MODEL FOR THE 14U WHITE GIRLS. SHORELINE STING ALL WISH SHAE GOOD LUCK AND GOOD FORTUNE WITH THIS PRECIOUS GROUP OF YOUNG PLAYERS. SHORELINE STING IS VERY HAPPY AND PROUD TO INTRODUCE OUR NEWEST AND YOUNGEST 2019 TEAM. THE 10U TEAM OPENED THEIR 2019 WINTER PRACTICE SEASON IN NORTH BRANFORD, CT. THE TEAM WILL PRACTICE INDOORS EACH SATURDAY MORNING THROUGH MARCH. 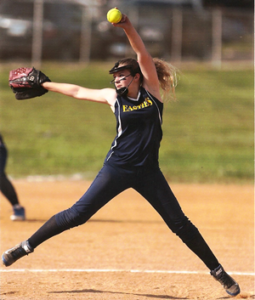 BEGINNING IN THE SPRING AND THROUGH THE SUMMER, THEY WILL BE COMPETING IN THE CONNECTICUT VALLEY FASTPITCH LEAGUE (CVFL), AS WELL AS, ONE FULL SANCTIONED TRAVEL EVENT AND THE CVFL SEASON ENDING TOURNAMENT IN JULY. THE TEAM IS COACHED BY PAUL LUDINGTON AND HE IS ASSISTED BY DEAN VITARISI AND KEVIN FROST. 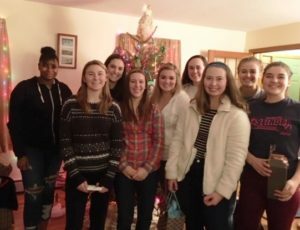 PICTURED (ABOVE FROM LEFT) BRIANNA PALMESE, AMBER MAIKOWSKI, ASHLEY BERARDESCA, MADISON DISTEFANO, LENA AGUZZI, ADRIENNE FROST. (FRONT FROM LEFT) DELANEY SHEPARD, SOFIA LUDINGTON, LAUREN VITARISI, SAM JOHNSON, TESSA DELUCIA AND PAYTON PALMESE. MISSING IS PEYTON LEMAY. COACH GAGE’S STING 16U BLUE TEAM TRAVELED TO THE LAKE GEORGE, NY AREA AND OPENED UP THEIR WINTER SEASON AT THE ADIRONDACK DOME IN QUEENSBURY FOR A COMBINED 16U/18U EVENT. STING MANAGED TO DISPATCH BOTH 16U OPPONENTS ON SATURDAY AND LOST THEIR ONE 18U CONTEST FOR A 2 – 1 POOL FINISH. THEY GOT THE “SHORT STRAW” ON SUNDAY, MATCHED AGAINST ANOTHER 18U TEAM. IT LED TO AN EARLY DEPARTURE, BUT A GRAND TIME WAS HAD BY ALL. PICTURED ABOVE AT TOP, (BACK ROW FROM LEFT) FINELLA SMITH, SARA COLEY, EMILEY WILSON, CAYLEE PARKER, CALLIE TEPER & CHRISTINA LOMBARDI. (CENTER STANDING) ARE VICTORIA GAGE, MAYA CONCEPCION, MEGAN HART, SAM FRANCESCHI AND (KNEELING BELOW) ARE COLLEEN EDWARDS AND VIVIAN PARADIS. 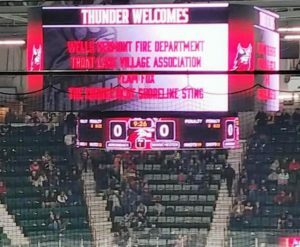 AT BOTTOM, THE TEAM ATTENDED AN ADIRONDACK THUNDER HOCKEY GAME ON SATURDAY NIGHT AND WERE WELCOMED ON THEIR “JUMBO-TRON”. 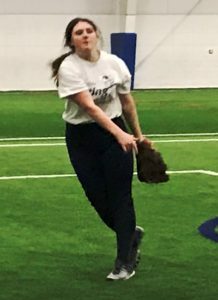 CONTINUING TO WORK ON THEIR SOFTBALL DISCIPLINES IN THE OFF-SEASON, BOTH 16U TEAMS ALONG WITH 18U CONDUCTED INSTRUCTIONAL SCRIMMAGES ON THURSDAY, DECEMBER 27. ALL THREE 14U TEAMS PARTICIPATED IN THE SAME “ROUND ROBIN” FORMAT ON FRIDAY, DECEMBER 28. THE EVENTS WERE HOSTED BY WIDE WORLD OF INDOOR SPORTS IN MONTVILLE, CT. THE SCRIMMAGES SERVED AS A VALUABLE COACHING AND DEVELOPMENT TOOL. PICTURED ABOVE ARE (AT LEFT) 16U GOLD PITCHER MAIRAID “RAIDER” AIKEN. (AT RIGHT) CHRISTINA LOMBARDI, 16U BLUE AND ERIN DONLAN, 16U GOLD. EXCITING EARLY COLLEGE DECISIONS FOR STING PLAYERS. GO KNIGHTS! !GO HAWKS! GO ANCHORMEN! 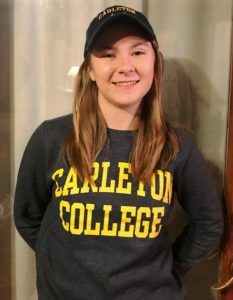 PICTURED TOP LEFT, STING 18U STANDOUT SECOND BASEMAN NIKKI MARSH, SPORTING HER CARLETON COLLEGE COLLEGE SWAG. NIKKI ACCEPTED A PLAYING OFFER AT PRESTIGIOUS CARLETON COLLEGE IN NORTHFIELD, MN. CARLETON IS CONSISTENTLY RANKED IN THE TOP TEN LIBERAL ARTS SCHOOLS IN AMERICA. NIKKI IS HONORED TO BE A TOP ACADEMIC AND ATHLETIC RECRUIT THERE. NIKKI IS A TOP STUDENT AND ATHLETE AT EAST LYME HIGH SCHOOL AND WILL SERVE AS A TEAM CAPTAIN IN 2019. SHE IS BEGINNING HER FOURTH SEASON WITH STING, BATTING 300+ EACH YEAR. ALEX BURDICK IS PICTURED TOP RIGHT (IN THE LEFT OF FRAME) WITH HER STING 18U, AND SOON TO BE, 2020 ROGER WILLIAMS UNIVERSITY TEAMMATE TAYLOR MYERS (PICTURED AT LEFT OF FRAME) ALEX WAS RECRUITED BY RWU AT THE 2018 CAPE COD SHOWCASE IN SWANSEA, MA AND AT THE RWU PROPRIETARY RECRUITING CAMP. ALEX IS A POWER HITTING THIRD BASEMAN, CATCHER AND OUTFIELDER, WHO IN HER INAUGURAL STING SEASON HIT .369 AND LED THE TEAM IN RBIS. ALEX IS A TOP ACADEMIC PERFORMER AT NORWICH FREE ACADEMY, WHERE SHE RECEIVED ALL-EASTERN CONNECTICUT CONFERENCE HONORS IN 2018. AFTER A WHIRLWIND PROSPECT CAMP AND CAMPUS VISIT, FOUR YEAR STING VETERAN, JULIE VINCENT ACCEPTED A PLAYING OFFER AT RHODE ISLAND COLLEGE IN PROVIDENCE. RIC HEAD COACH, BRIAN CLAYPOOL QUICKLY SELECTED JULIE AT CAMP AND INVITED HER TO THE RIC CAMPUS, WHERE HE MADE HER A PLAYING OFFER. JULIE IS A THIRD BASEMAN AND CATCHER, WHO HIT 300+ IN EACH OF HER STING SEASONS. SHE RANKS IN THE TOP TEN PER CENT OF HER CLASS AT NORWICH FREE ACADEMY. WE ARE VERY PROUD OF OUR HARD WORKING STING PLAYERS AND WISH THEM SUCCESS AT THE NEXT LEVEL. 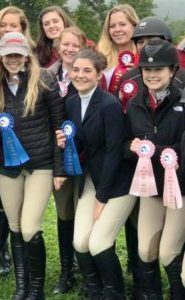 PICTURED (ABOVE LEFT), ANNIKA RYER (TOP) AND HER TRUSTED NEW COLLEGE BEST FRIEND, “HAWK” (BELOW LEFT) RIDE TO VICTORY FOR THE MARIST COLLEGE RED FOXES AT AN EQUESTRIAN EVENT IN NEW YORK. SHE DISPLAYS HER BLUE RIBBON (RIGHT CENTER) WITH HER RIDING MATES. “HAWK” GOT A CARROT. AN OUTSTANDING STING 18U OUTFIELDER, ANNIKA WAS A MULTI-SPORT HIGH SCHOOL ATHLETE (VOLLEYBALL, BASKETBALL, SOFTBALL AND BASEBALL (YES, BASEBALL!) 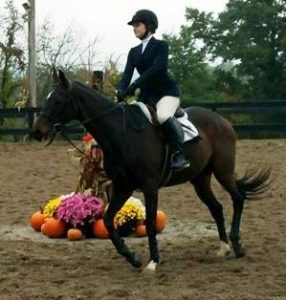 NOW, IN COLLEGE, SHE TAKES ON, QUITE SUCCESSFULLY, EQUESTRIAN EVENTS FOR MARIST. 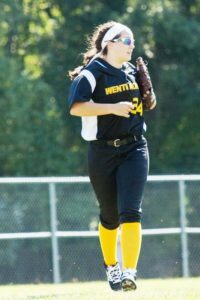 ON SATURDAY, SEPTEMBER 29, STING 18U RETURNING VETERAN AND INCOMING COLLEGE FRESHMAN BRI BEVERLY TOOK THE FIELD FOR WENTWORTH UNIVERSITY (BOSTON, MA) IN THEIR ONE ALLOCATED FALL TOURNAMENT. BRI WILL BE MAKING AN IMMEDIATE IMPACT IN HER INAUGURAL SEASON. SHE’S PICTURED BELOW PATROLLING LEFT FIELD FOR THE LEOPARDS. 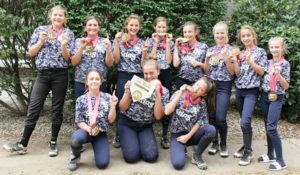 SHORELINE STING 12U GOLD BEGAN THEIR 2019 CAMPAIGN WITH VICTORY IN THE USSSA FALL BRAWL IN EAST HARTFORD. 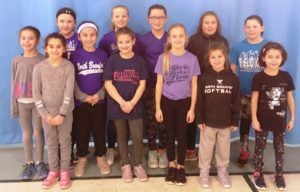 STING SWEPT THE FIELD IN A TWO-GAME POOL SATURDAY AND A DOUBLE-ELIMINATION SATURDAY, BEATING THE BVSA LADY TITANS AND THE LADY PRIDE EACH TWICE. PICTURED ABOVE STANDING (FROM LEFT) EMMA BAYOR, GABBY BIGIO, ALEXA FALCIONI, GRACE PHANEUF, NATALIA LUCIBELLO, REECE HEBERT, GABI SENERCHIA, ADRIANA HILLS. KNEELING IN FRONT (FROM LEFT) KILEY MULLINS, ADDIE SMITH, ALAYNA MARIANI. THE FALL SEASON IS UPON US AND THE NCAA RECRUITING SEASON IS WINDING DOWN. 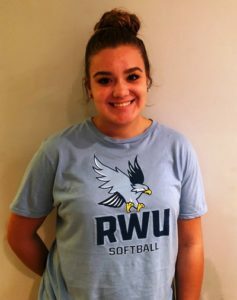 WE ARE ALL PLEASED TO ANNOUNCE THAT STING 18U STANDOUT PITCHER, TAYLOR MYERS HAS ACCEPTED AN OFFER TO PITCH FOR ROGER WILLIAMS UNIVERSITY IN BRISTOL, RI. 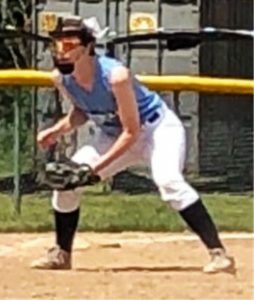 TAYLOR WAS RECRUITED BY THE HAWKS DURING HER MAGNIFICENT PERFORMANCE AT THE CAPE COD COLLEGE SHOWCASE IN SWANSEA, MA, WHERE SHE WON THREE GAMES AND SAVED ONE FOR STING 18U. SHE CONTINUED HER EXCELLENT PERFORMANCE IN THE CIRCLE AT THE RWU CLINIC ON SATURDAY, SEPTEMBER 8. TAYLOR IS BEGINNING HER SENIOR YEAR AT EAST HAVEN HIGH SCHOOL, WHERE SHE IS AN EXCELLENT STUDENT AT THE TOP OF HER CLASS. 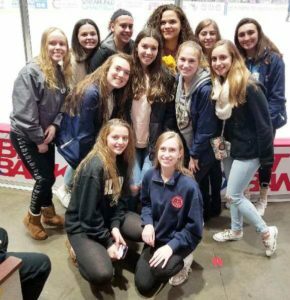 SHE IS LOOKING FORWARD TO HER UPCOMING SCHOLASTIC SEASON, AS WELL AS, THE 2019 STING SUMMER SEASON. 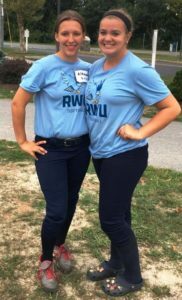 RWU WAS TAYLOR’S FIRST COLLEGE CHOICE AND WE ALL THANK COACH MAUDIE AND COACH MASTRANGELO FOR THEIR ATTENTION TO TAYLOR. WE ALL WISH CONGRATULATIONS TO TAYLOR AND HER FAMILY ON THIS WONDERFUL ACHIEVEMENT AND OPPORTUNITY.